Bluebonnets! Another Texas hill country subject for a transparency. I am weaving a simplified imitation of this celebrated wildflower. It starts with a photograph I took of bluebonnets in our hill country backyard this spring. 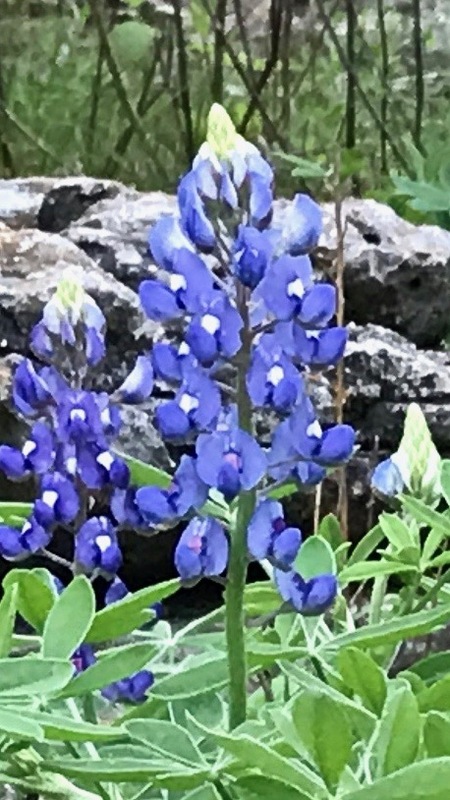 Cropped and enlarged photograph of our Texas hill country backyard bluebonnets. After enlarging the photo to poster size, I outlined the basic shapes that I wanted to include in the transparency. Next, I turned the poster over and transferred the outlines to the back. I traced the lines onto a piece of buckram to use for the cartoon. Everything is ready (the warp has already been tied back on). Let’s get started! 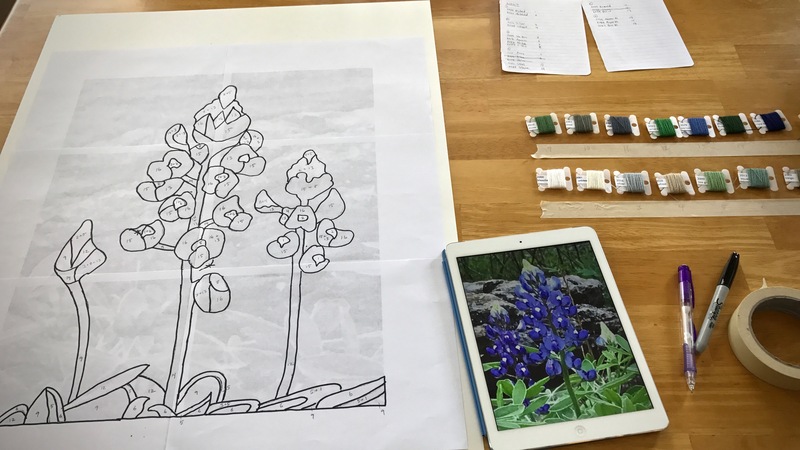 Planning colors for the bluebonnet transparency. Photo on the iPad is used for reference in selecting Mora wool colors. Pattern is traced onto a piece of buckram to use as the cartoon. Dashed line down the center of the cartoon will be lined up with the center warp end when the cartoon is pinned to the back of the weaving. We have been given a true picture of love. God shows it to us in Jesus Christ. Christ loved us and gave himself up for us. With child-like fascination, I want to imitate the heart of that kind of love. To walk in love like Christ means to give yourself away for the sake of others. 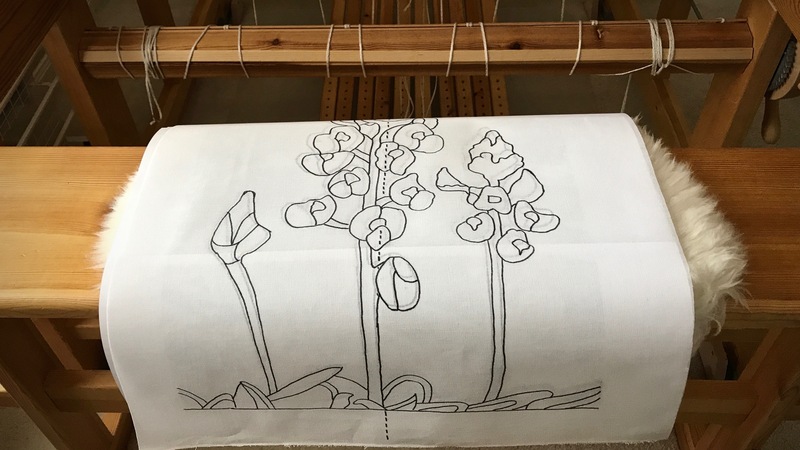 Linen and wool threads are not sufficient to show the living beauty of a bluebonnet. Nor are my efforts to love going to be perfect. But by keeping the picture in front of me as I weave, I hope to convey the delight of springtime Texas bluebonnets. And present a transparent picture of love that’s out of this world. May you imitate only the best. Beautiful! Your enlarged photo looks like a watercolor. It and your weaving remind me of the paint by numbers we did as kids – a much more grownup version. I often think of transparency weaving as paint-by-number with yarn. The bluebonnets in nature are better than anything I could think up or draw. You do have the patience of a saint. This is going to be beautiful! Hi Beth, It doesn’t feel like patience to me, since I enjoy it so much. I easily get lost in time at the loom. I am intrigued- I have done a bit of tapestry but know nothing about transparencies. It is quite a process! Your patience and focus is amazing. Can’t wait to see this grow! Hi Maria, This feels a lot like tapestry to me. For some reason, though, this seems less complicated. I’d like to play around with this technique and maybe do something that is more like tapestry, but with the plain weave pick in between each pattern row. I have a friend who has done some of that, and it is lovely! I’m excited to see this grow, too. Hi Martha, I love bluebonnets!! This project makes me very happy. 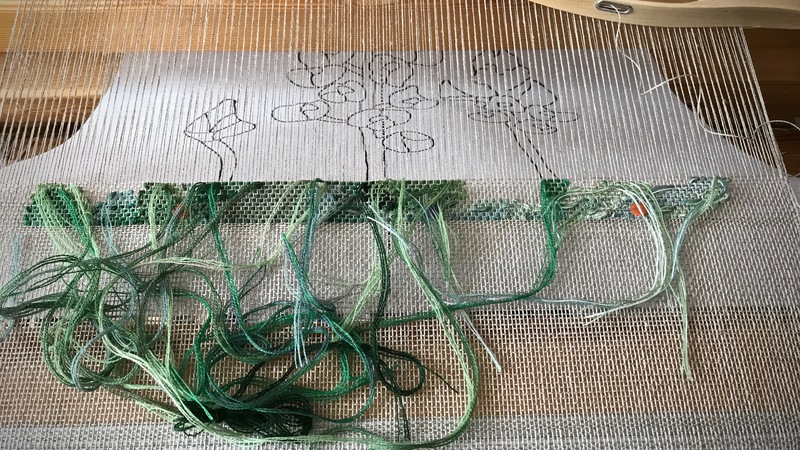 how do you keep the cartoon in place during the weaving process? Hi Maggie, The cartoon is pinned under the weaving with three flat-head straight pins. Every few inches, before I advance the warp, I move the pins forward while checking to make sure the center line on the cartoon lines up with the center warp end. Good question! I see you are using Mora wool. Where do you buy yours? How many strands do you use? Hi Alice, I buy much of my Mora wool from Vavstuga.com. I think I used 3 strands of Mora for these transparencies.